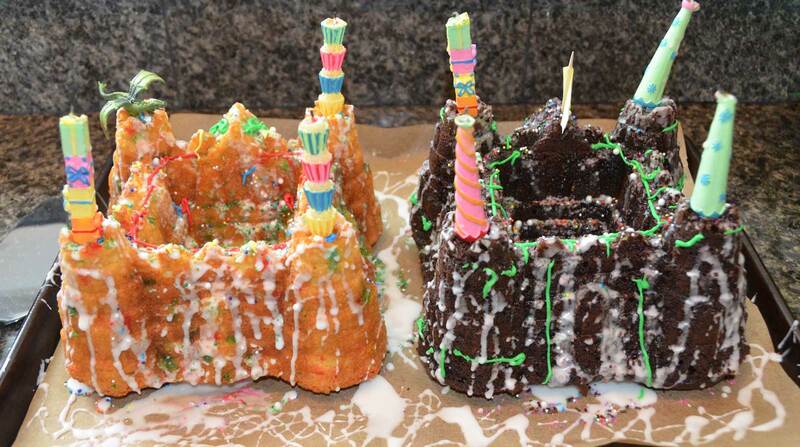 Which kid-decorated castle would you rather lay siege to, chocolate or vanilla? Let’s start with a warning. My wife and I go overboard on birthday parties. We often take an unconventional approach to the parties, trying to create experiences that show the kids something new. At times we’ve gone a bit far (cutting out edible fruit arrangements for my daughter’s party was gorgeous but insane work, for example). I share the following in hopes it inspires, but please adjust to your level of sanity. Also, I’ve blurred the kids’ faces so as to protect their identities. We don’t actually have doppelgangers as friends. I think. Our kids have chosen some cool themes in the past: race cars, faeries, art, horses. For his 7th birthday party my son chose Dragons! I could not be happier. My wife and I started planning about a month in advance. 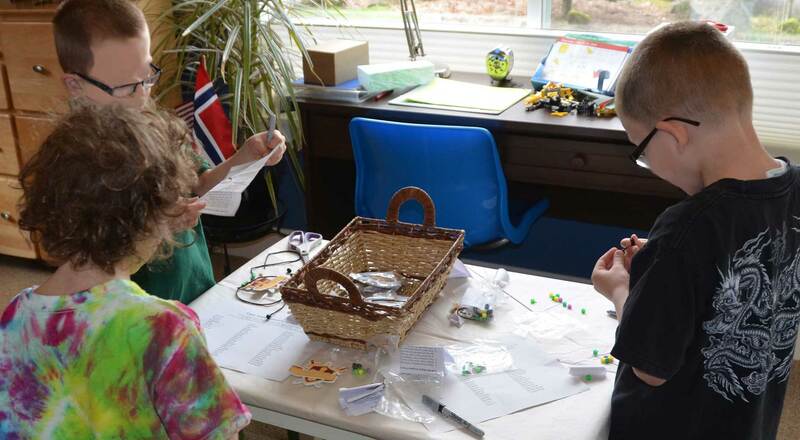 Our general approach is to have a few artistic activities to let kids find something that interests them, then a central activity that is the main event, and then cake. We focus on creative opportunities and always ditch anything electronic or overly toy based. 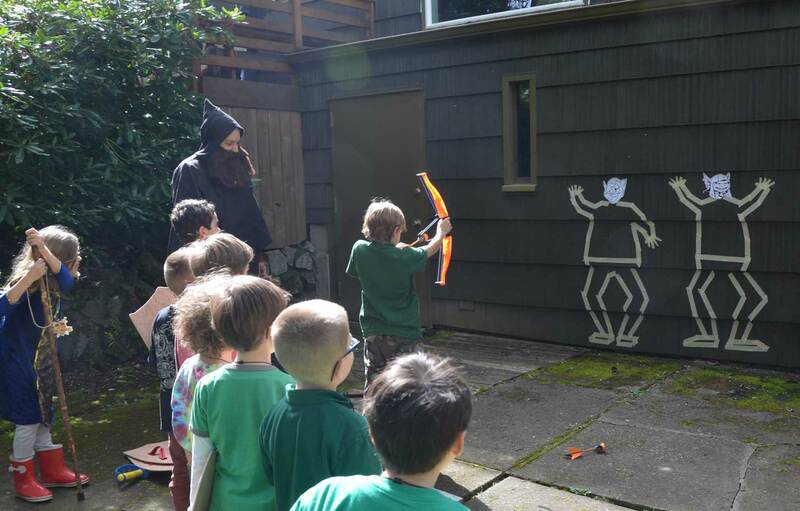 The more I thought about it, the more I wanted to have a LARP (Live Action Role-Playing) styled event where kids really used their imagination. This was easy! We placed on our coffee table our various dragon and monster books (our kids dig A Practical Guide to Dragons , Dragonology: The Complete Book of Dragons , How to Trap a Zombie, Track a Vampire, and Other Hands-On Activities for Monster Hunters: A Young Wizards Handbook , and Encyclopedia Mythologica: Dragons and Monsters Pop-Up . Two of them are published by Wizards). I brought down my colossal, gargantuan, and huge dragon DDM minis and placed them on the mantlepiece and other locations high up (so kids would see them but not grab them). 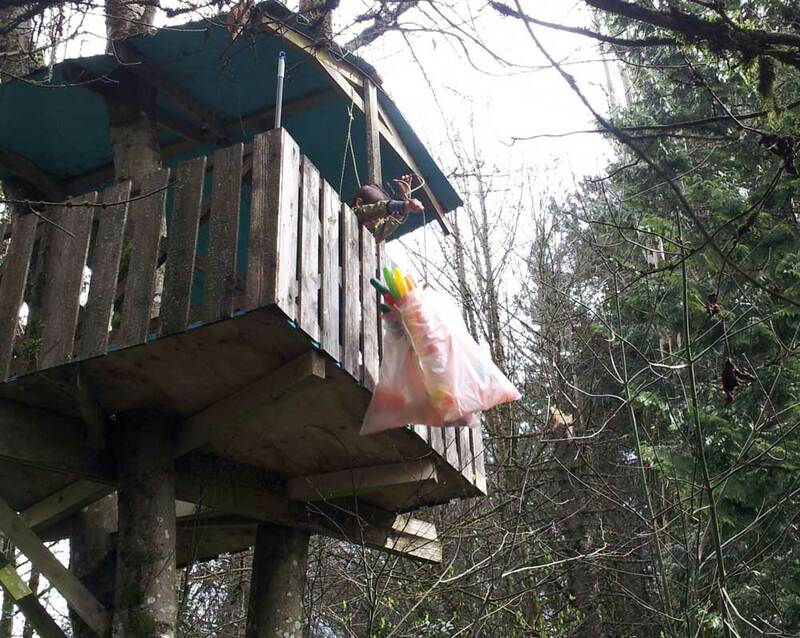 We placed healthy snacks in various locations. We used organic green veggie juice for kids and labeled it as Dragon’s Blood. Amazing how kids loved it with the different name! For adults we had two beverages, one similar to a mimosa and another a sangria. We labeled both with creative names. We had some cheeses and other adult snacks as well, all to encourage adults to stay and participate instead of leaving. We had about a third of the parents stay and enjoy the party, which is fun for us and usually for their kids. One of the simple artistic activities we came up with was for each kid to select their ‘knight name’ and then put together a necklace name tag. The name tag was a kit we bought for a very reasonable price. It has some beads, a place to write your name, a shield look, and a cord. For the names, here I put on my adventure design hat. If each kid adopted a fantasy name, that might help with immersion. I visited various character name generator sites and ultimately settled on just a list of words such as “wolf, bold, hammer, dodger” and so forth. Then the instructions said to pick two and put them together. We had cool names like Sir FireHammer and Sir WolfTamer! 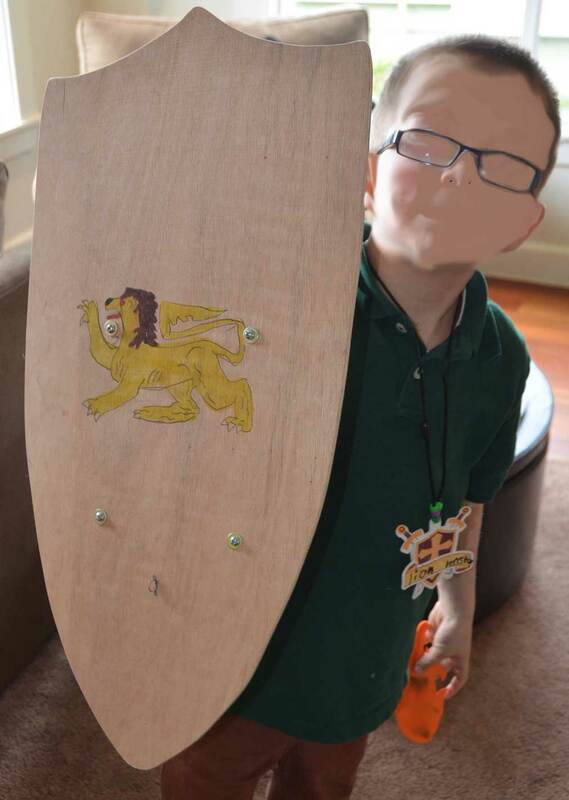 My wife came across this cool blog where a couple made wooden shields and the kids painted them. I enlisted my Dad, and we went to work (and shopping at the local hardware store). We largely followed the ideas on the site. 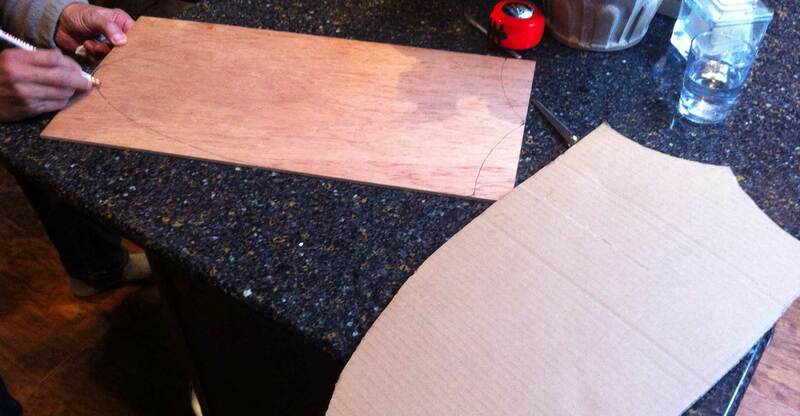 We started with a cardboard template and then marked off the shield area on the wood. My Dad is pretty awesome, and even when I had a business trip he kept at it. We had 12 shields for our 10 guests, just in case a mishap took place. There’s no crying in dragon hunting! Along those same lines, I shared the surprise with my son the day of the birthday right before people arrived, so he could take his time and make his shield without any pressure. Then he could help others during the party. During the party kids took various printouts we had made with line-art fantasy drawings and taped them over a sheet of carbon paper onto the wood. 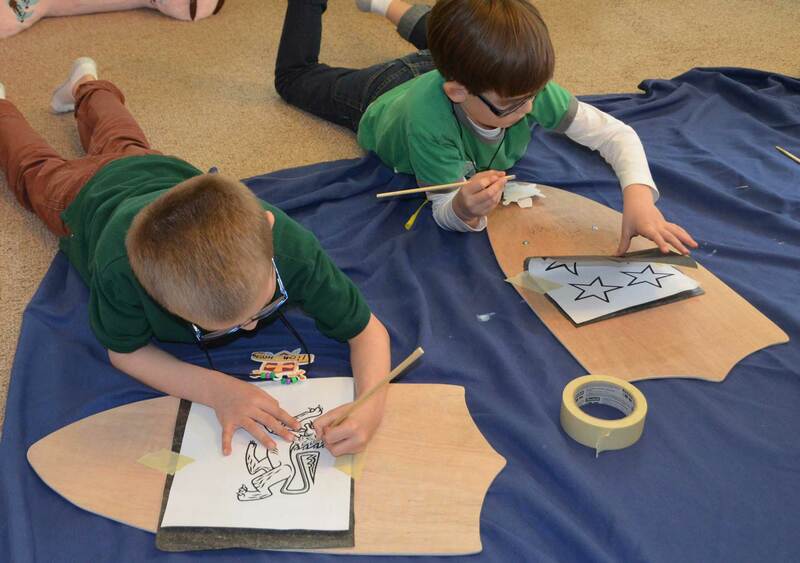 They traced with a wooden chopstick, then pulled off the sheets to reveal the outline on the wood. The kids then used wood markers to color the outlines in. Kids had a blast with this and loved that they got to keep a cool wooden shield after the party! Our last activity was a twist on “pin the tail on the donkey”. Here my Mom went nuts and painted this beautiful dragon (which my son now has in his bedroom!). She also cut out foam fireballs and painted them. During the event kids took turns putting on a blindfold and trying to pin their fire on the dragon’s mouth. We put each kid’s name on the back, then tape over it. That was a key, as it kept kids from feeling bad or wanting to call for a do-over. No one really knew who won until the end. The winner received a ‘dragon orb’, a rubber ball decorated with the image of a dragon. I think it came from the Dollar Store. The main event was the LARP-style adventure. On a couple of evenings I sat down to draft and refine the adventure, which would play out in the woods behind our house. Once I liked it I had the various relatives review it and we tweaked a bit. Luckily, they loved the idea of the adventure. They even wore costumes! 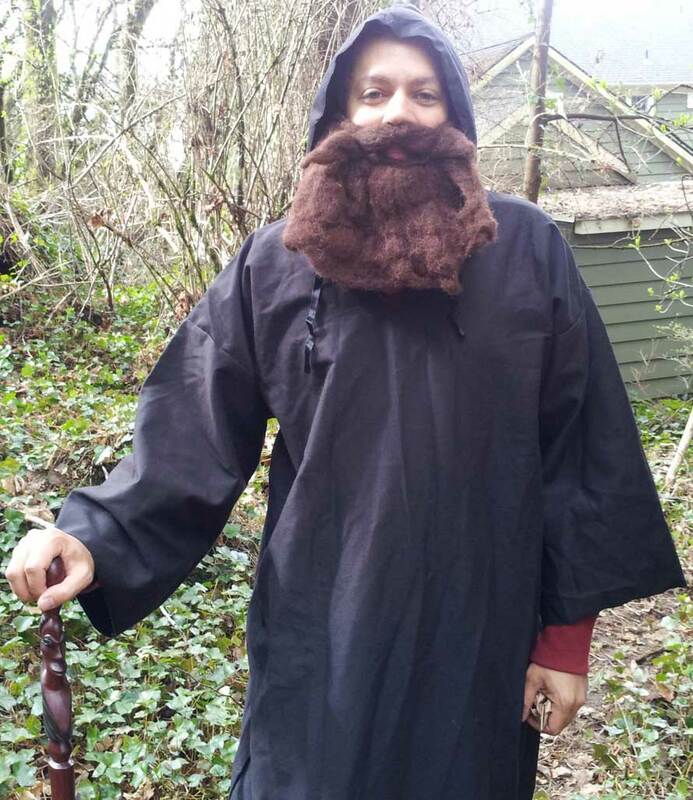 We began by my putting on a very simple robe I had from a Halloween long ago, plus a beard (used for role-playing dwarves… I have three colors, of course). I added a cane I found during my travels in Africa. I came down to where the kids were and introduced myself as the King’s Storyteller and told them all knights were being called together, as the Queen had an important message. We gathered everyone inside a tent, which we had set up downstairs. The tent’s purpose was to change things up visually and focus their attention. The Queen (one of the grandmothers) told the knights a dragon had come, and might destroy the castle. It had also sent an army of goblins our way. She asked whether the knights would help, and they all said yes. (One asked me to make sure it wasn’t too scary and I promised it would not be). As the Storyteller I traveled with them, helping the story along as needed. 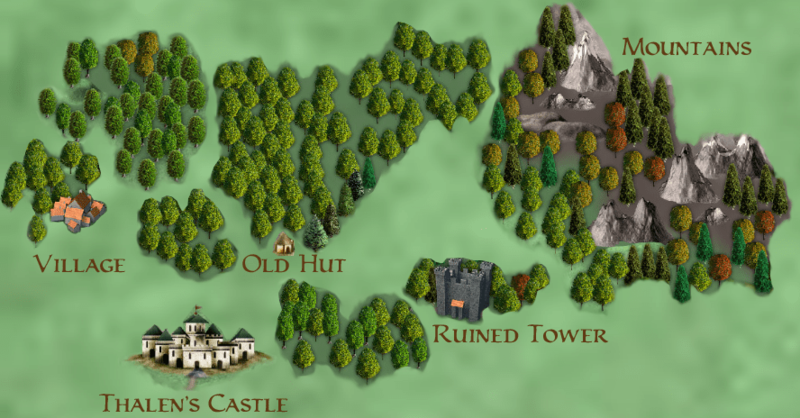 I also provided three copies of a map I created using various images from the ProFantasy example map, adding labels for each of the areas we would visit. The first call to action was to stop the goblins. I decided this could be a good way to show that this was about imagination rather than realism. When the last kid fired, the rest of the goblins turned tail and ran. Victory! The kids weren’t quite ready for immersion yet (one would periodically remind me that I was actually my son’s dad), but they were getting there. I told them that legends spoke of a wise crone that knew about dragons. This was about the third time a kid said “what does that mean,” so we defined crone and various other terms. Free vocab lesson! Wait untill you read Temple of Elemental Evil, kid! 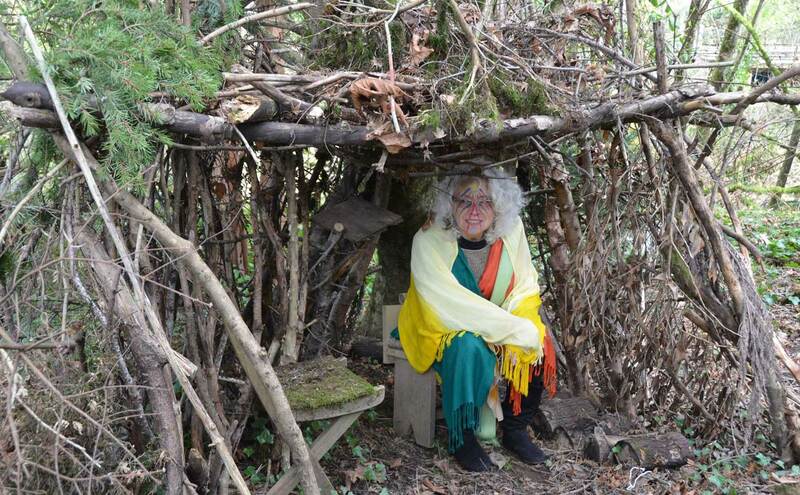 My mom played the crone, and was in a stick hut I had built for my kids last year. She’s a former English teacher and loves a good play, so she had her face painted up and spoke in evocative ways. The crone knew of something that could help, but first asked each knight to speak of what made them worth of this secret. What followed was hillarious. Answers included “I can stab the dragon” and, very strangely, “slavery”. Kids. The crone let them know these were not worthy things. Then one kid spoke up, “I like to give people love and take care of people.” The crone said, “this is worthy,” to which the kid added, “oh, that was easy!” Gotta love kids. Slowly but surely the other knights found something worthy and the crone shared the secret of the fire seeds. Growing on the mountain, their magic could protect a knight from fire! We have a steep hill nearby, so off we went (the kids consulting their map in response to my questions of where we might look). Upon the slope we found bright Easter eggs, each containing a single Red Hot candy to eat. The cinnamon helped communicate the message of this being a magic protection against fire. Back down we came, running into the King, a Ranger. The King asked the knights what they had learned, and it was great seeing how they were now well immersed in the story. They were really proud of all they had discovered and done! The King told us he had learned of a ruined tower where swords that offered protection against dragons could be found. The tower had a ghost guardian, and she would only allow knights to enter if they could solve three riddles. My daughter had wanted a role, so she had broken away from the group a bit earlier and donned a shawl and stood by the tower (a treehouse). 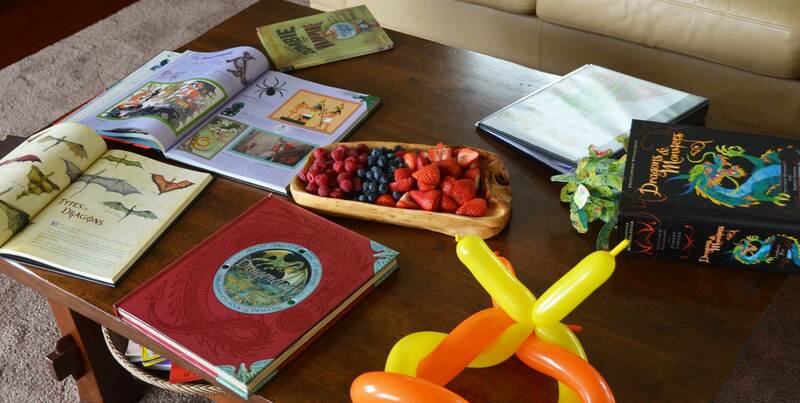 There she read three simple riddles suitable for kids and themed for the event. 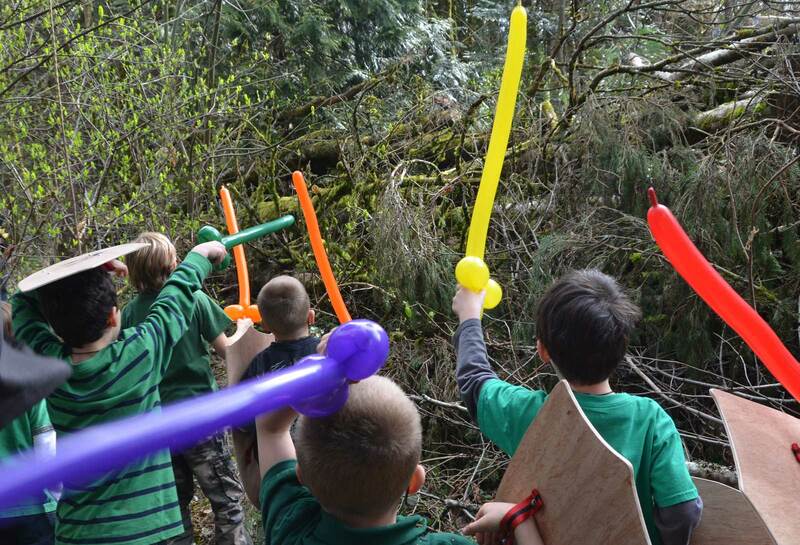 When they solved the third my son climbed up the treehouse and found a set of balloon swords! (Grandpa took up magic and ballooning two years ago and was glad to make these). My son lowered the swords down for everyone to take one. Armed with dragon-bane swords and protected from fire, it was time to face the dragon! My Dad donned a Halloween mask and made roaring sounds. 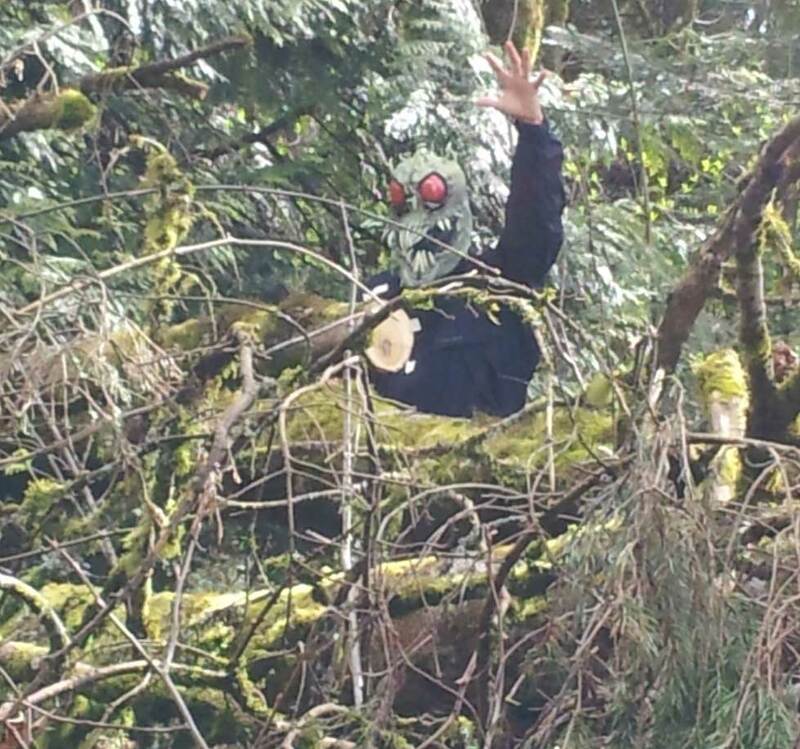 He stood on the other side of a fallen tree, so as to have a barrier from the kids. This made it easier to imagine he was a dragon and harder for them to decide they should charge him and beat him up (kids can be fearless!). I narrated that he breathed fire, and as I said that I hurled red glitter onto the knights. That was pretty fun (some asked for seconds). They were immune! Now was the time to brandish the swords and roar back, so as to scare it away! The kids did, and the dragon left! I congratulated the knights and talked to them a bit about this so as to give my Dad time to escape. Then I asked them if they knew what a dragon kept in its lair. One of them guessed it: treasure! They searched and found a cardboard box we had decorated like a chest. My son and daughter tore it open and inside were bags of gold (gold-foil chocolate coins) and a miniature dragon (later a kid was walking around with his, comparing it to my DDM minis so as to figure out which one was its daddy). The adventure was a great success. Kids were beaming ear-to-ear as we returned for the feast in their honor (pizza and cake). Kids are awesome. Planning a LARP style event as part of a birthday for kids actually can be a ton of fun, and kids today really will act out fantasy roles and suspend disbelief! Also, my family is insane. Yay! This entry was posted on October 20, 2015 by Alphastream and tagged Food.